Welcome Wholesale Customers! Click here. 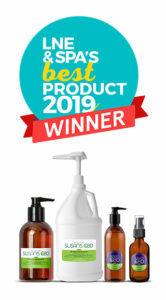 Susan’s CBD is pleased to announce our CBD Massage Oil has won the Best of 2019 Product Award from LNE & Spa Magazine! 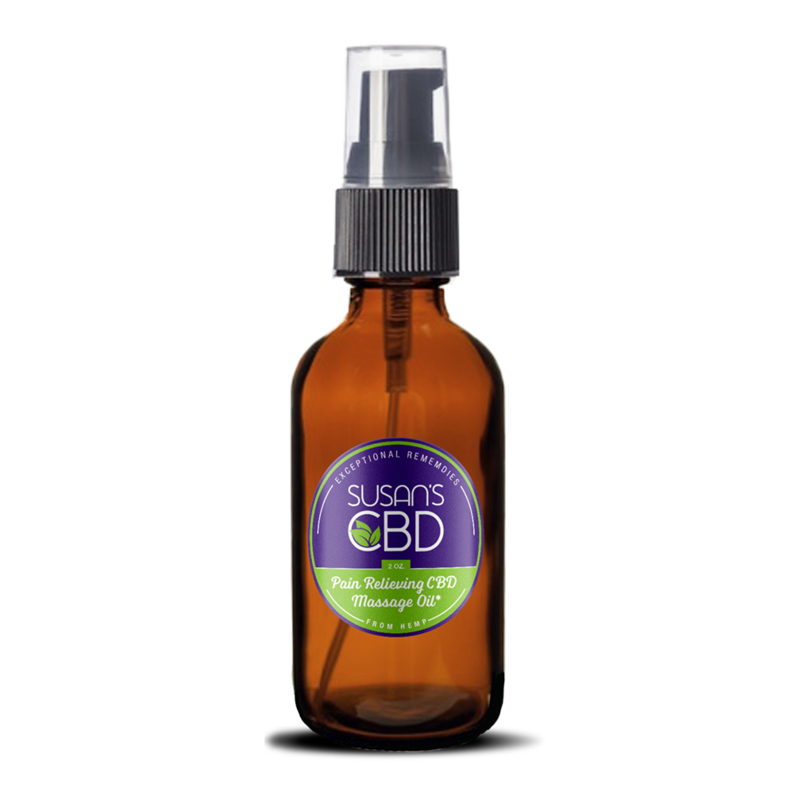 Chosen from thousands of products on the market, Susan’s CBD Massage Oil was voted the best Massage Product for 2019 by their readers, estheticians and spas. With this seal of approval, you can be sure our massage oil will bring quality relief. Try some today! Our CBD products are made with a specialized 99% pure form of CBD isolate from hemp, which allows us to make highly effective products that may help with pain relief and reduce inflammation*. The isolate is a highly purified, crystalline form of CBD from federally legal industrial hemp, which is odorless and has non detect levels of THC in it. We professionally lab test our products to ensure that we are putting in an effective level of hemp CBD. Results for Massage Oil, Tincture, Pain Relief Salve, Tattoo Aftercare Salve, Bath and Foot Soak, Sports Recovery Salve, Bath Bomb, After Wax Treatment and Lip Balm. Our 99% pure CBD formula differs from most CBD salves and products on the market that have low amounts of cannabinoids which can’t offer the effective pain relief that our products do*. Milligrams Matter™ – each of our salves offer 300 milligrams of purified CBD per ounce from legal hemp. Our massage oils are 150 mg of purified CBD per ounce. Our products contain zero THC. 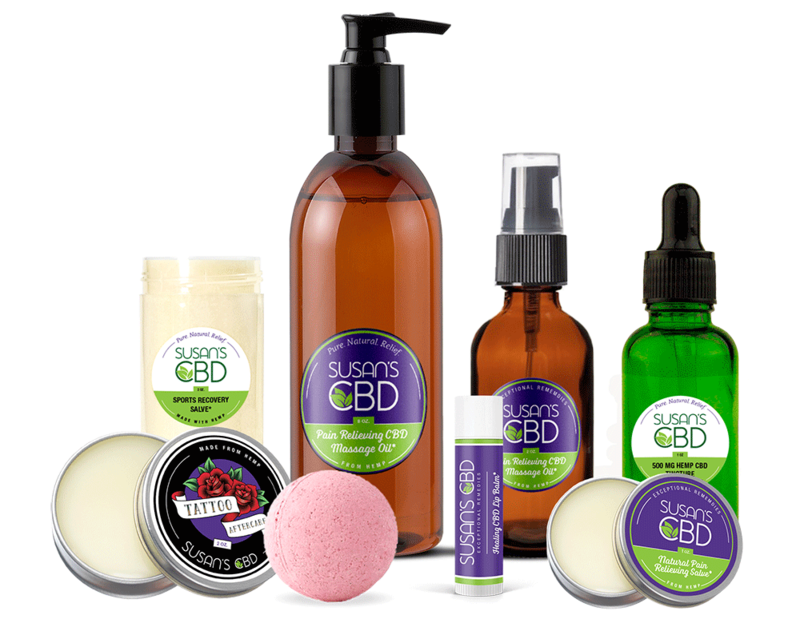 Because our products are from legal hemp production and are considered personal care products, they can be sold and shipped to all fifty states. 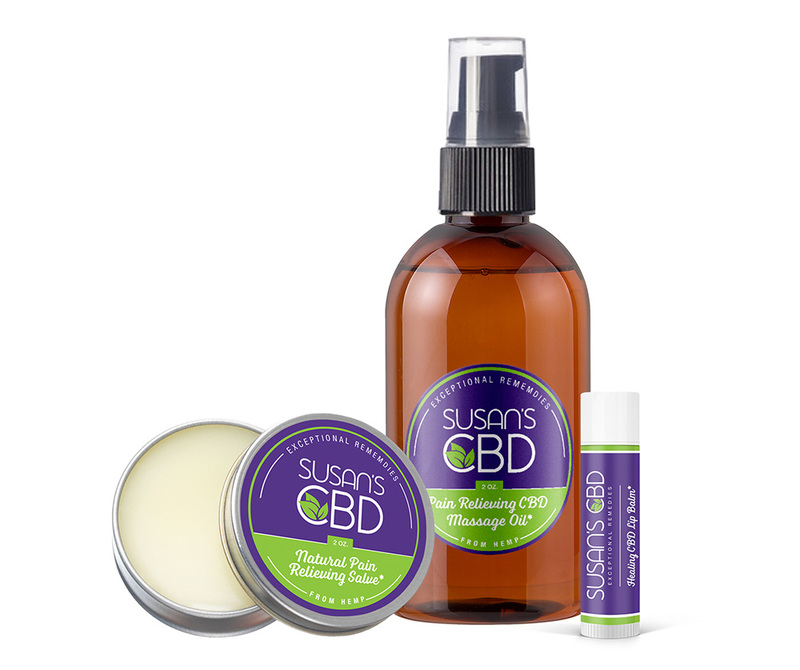 Our CBD products contain all natural ingredients and essential oils which are highly moisturizing for your skin in addition to bringing you the natural benefits of Cannabidiol from hemp. 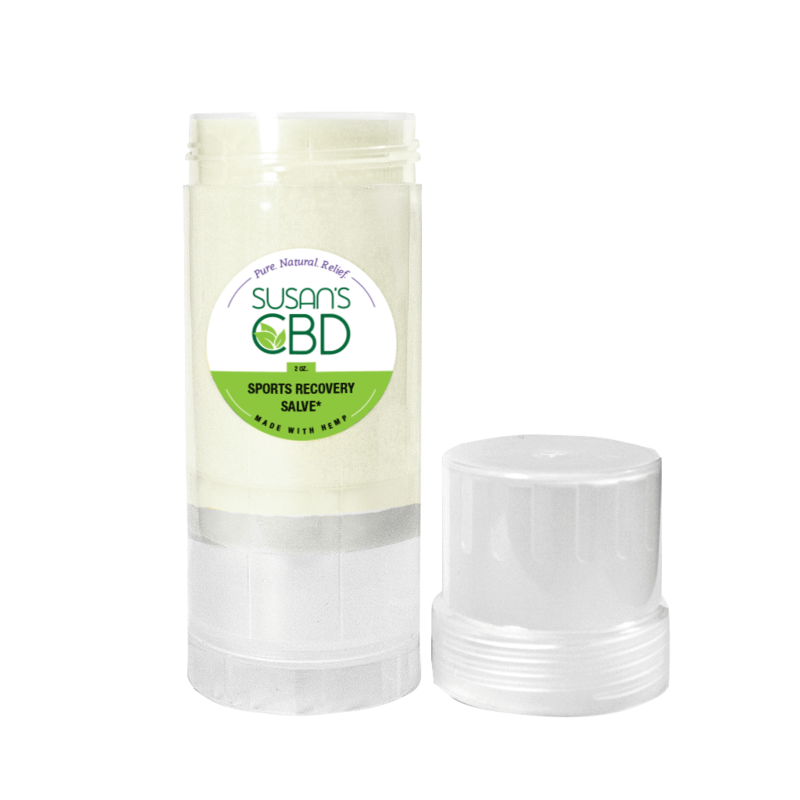 Susan’s CBD uses isolate from hemp, grown organically under the sun, odorless and in crystalline form, which is guaranteed to be 100% THC free. Try our CBD products and experience for yourself what everyone is talking about – the healing power of hemp. • Pain relief salve soothes aching muscles. • Massage oil that feels so, so good! I have ordered the massage oil and healing salve. It has worked wonders for us. These products are helping my arthritis and my husbands sciatica so much. We have tried other brands and your is by far the best for us. Thanks again. So far I am really impressed with your products. I have tried them on myself and several family members and the pain relieving effect is impressive. I just wanted to let you know how much I appreciate the CBD starter pack I received a few days ago. My friend Sandi and I had been discussing our knee problems and she showed me your salve that she had been using. I've been playing racquetball for quite some time now and my left knee was starting to give me a lot of problems. I am not supposed to take anti inflammatories because of my chronic kidney disease, so ice was pretty much my only alternative. When I received your package I had been dealing with a lot of severe pain in my knee for the past few days. I immediately rubbed some of the salve on my knee and I have not had any pain for the past two days, and I've been playing a lot of racquetball. I've been using it 3 times per day. I've tried many CBD salve products, and this one by far is the most effective! 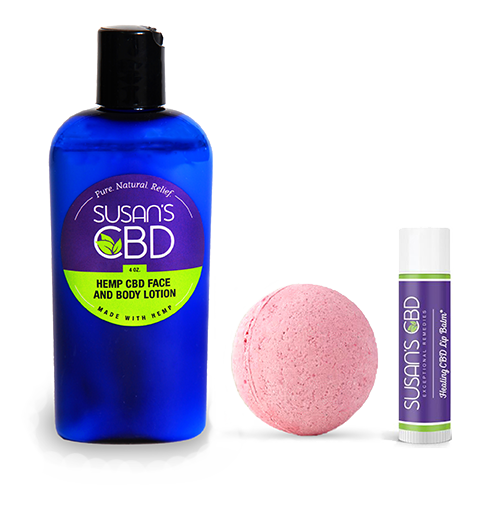 I have a herniated disc in my low back and I find relief when using Susan's salve. I'm able to decrease my pain killers because of this product. I'm so grateful! I am an older person with older knees - and this stuff WORKS! Relieves the stiffness, and stairs are not so intimidating.